It is replaced by the Symbol LS3408 Series: LS3408ER and LS3408FZ. Enhanced optics offer superior performance over all ranges. In warehousing transportation and other industrial applications.when a scanner has to be rugged yet versatile in order to read a broad range of symbol densities - both close up and at long range.in temperature extremes or rigorous conditions.the scanner to choose is Symbol Technologies' LS 3203ER Extended-Range Scanner. The LS 3203ER reads barcodes as far away as 35 feet (10 m) or more and as close as 4 inches (10 cm) - giving it the greatest range of any scanner on the market today. LS3203ER, The LS3203 Extended Range Scanner (Decoded) is the New Standard in Ruggedized Scanners. In warehousing, transportation and other industrial applications...when a scanner has to be rugged yet versatile in order to read a broad range of symbol densities - both close up and at long range...in temperature extremes or rigorous conditions...the scanner to choose is Symbol Technologies' LS 3203ER Extended-Range Scanner. The LS 3203ER reads barcodes as far away as 35 feet (10 m) or more, and as close as 4 inches (10 cm) - giving it the greatest range of any scanner on the market today. Because the LS 3203ER reads all symbol densities over the broadest range, it's able to perform multiple tasks in the same location. For receiving and put-away, it reads UPC product codes; it also reads 20 to 40 mil case codes from close up to several feet away. For picking and shipping, it reads 70 to 100 mil retroreflective symbols on distant storage locations or shelf edges. Symbol offers the LS 3203ER in two models to meet your application needs: an undecoded version (model LS 3203ER ) for use with a portable terminal with decode capability; and, a multi-interface decoded version (model LS 3203ER ) providing both wand emulation and RS-232C connectivity. The LS 3203ER model can also use Symbol's exclusive Synapse "smart cables" for connection to many different hosts without a separate interface controller. What's more, this series of extended range scanners is not only flexible, it's rugged, making it ideal for fixed station, portable terminal and fork lift duty. 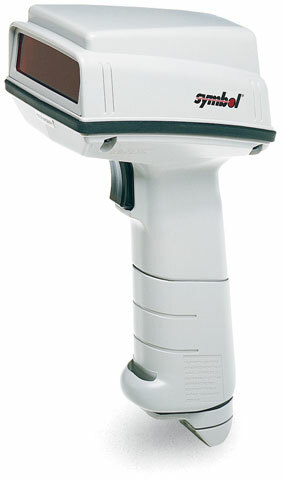 Like all members of Symbol's LS 3000 family of handheld scanners, the LS 3203ER is designed for aggressive scanning performance, while combining toughness and durability with ease of operation. It withstands repeated six-foot (1.8 m) drops to concrete, yet it's light weight and ergonomic design assure user comfort. A key source of the reliability inherent in the LS 3203ER is Symbol's patented Mylar® scan element - a technological innovation that represents a major improvement over conventional scanner motors. The frictionless Mylar scan element makes these scanners remarkably long-lasting because it completely eliminates engine wear. It also provides another benefit - lower power usage because no energy is expended overcoming friction. Symbol has so much confidence in the LS 3203ER that we back it with a limited lifetime warranty on the scan element...a Symbol exclusive. Intuitive "aim and shoot" operation automatically adjusts for symbol size and distance from the scanner. Synapse "smart cables" eliminate the need for a separate interface controller, making the LS 3203ER easy to install, maintain and use. Rubber bumper improves sealing against windblown rain and prevents the scanner from sliding off countertops. Ultrasonically welded window and sealed housing ensure that the LS 3203ER will resist the intrusion of dust and dirt. Operation in temperature extremes of -22° to 122° F/30° to 50° C allows the LS 3203ER to be used in harsh environments. The LS 3203ER Extended-Range Scanner: viewed from any distance, it's another best-of-class product from Symbol Technologies, the world leader in barcode-driven data management systems, with more than 6 million scanners and terminals installed.